The goal of exercise is to tear down skeletal muscle tissue and then repair it making it stronger, more enduring, flexible, and better for fat and sugar metabolism. The body is made up of protein and water and stores fat and sugar. Exercise breaks down protein, this protein must be replenished in order for the tissue to be repaired and become stronger for the next time there is a physical stress presented. 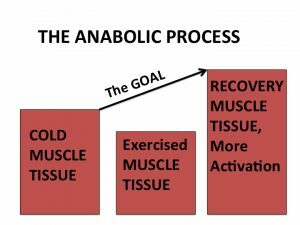 The following pictures depicts the anabolic process. 3. Recovered tissue allowing greater activation. Enzymes grow BIGGER allowing for greater fat burning and sugar metabolism. Regular exercise should be designed to gradually build the anabolic process. Overtraining will deter progress and hinder skeletal muscle activation.